We have been privately owned and family operated for over 23 years. Our policies and standards are set in-house, designed to provide prompt, competent, quality services. Lonny Moore's Collision Repair will repair, repaint or replace warranty items when claim is made while the customer owns the vehicle, unless caused by or damaged resulting from unreasonable use, maintenance or care of the vehicle. Warranty is not transferable and is null and void if repairs are altered, adjusted or tampered with by any person other than Lonny Moore's Collision Repair. Specifically excluded are incidental costs, such as towing fees, car rental charges, travel expenses, or assemblies and components which are not specifically covered by warranty. Consequential damages are also excluded, such as damage to other assemblies and components resulting from a defective part or installation of such part installed or repaired during the repair. Also excluded is rust ... surface rust, rust through and/or damage caused by rusting of interior or exterior panels. Customer's are reminded that in order to obtain warranty benefits, they must provide the owner's copy of the warranty document before requesting warranty repairs or parts. Warranty repairs, adjustments and inspections must be made onsite during normal business hours. Hot Rods, Custom Builds are excluded, unless paint is taken down to bare metal, and other terms and conditions to be determined at the business owners discretion. Fleet, wholesale and other discounted repairs void all warranties as well. All insurance paid repairs fall under the lifetime warranty clause. We use the finest products and equipment, which lead to the best repairs for our customers. We take pride in our ability to match factory finishes with special attention paid to paint texture, gloss and hue. We have a diversified and qualified workforce that allows us to handle various customer needs. We work on all types of vehicles. You can trust us to take excellent care of your collision repair, hot rod restoration, fleet work, and heavy truck work. 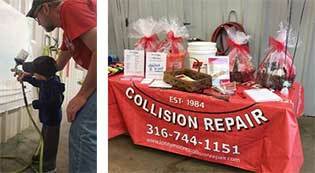 On April 29th, Lonny Moore’s Collision Repair held their first Open House in the 23 years they’ve been in business. In spite of heavy rain, people gathered to tour the shop and participate in fun family activities. The team received many accolades and positive feedback from customers. LMCR would like to thank vendors for their generosity by way of donations and giveaways. Auto accidents are unexpected and stressful. Even the most careful drivers may be involved. In addition to the inconvenience of missing work or a crucial appointment, you also have to deal with damage to your car, liability issues, possible traffic citations and even injuries in some unfortunate cases.